Stansbury’s Anjalee Batchelor tags out Tooele’s Loryn Fonger between second and third in the top of the fifth inning during Tuesday’s matchup. Kilee Christiansen connects for a single in the sixth inning against Tooele. Christiansen and the rest of the Stansbury Stallions beat the Buffaloes 12-4 in the cross-county rivalry game. After Tuesday’s Region 11 matchup between Tooele and Stansbury, one team was turning its focus to a huge game later this week with the inside track to the region title on the line. The other was merely trying to regain any focus at all. 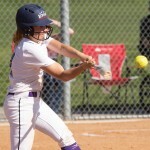 Stansbury took advantage of five Tooele errors, three of which came during a 10-run outburst in the second, third and fourth innings as the Stallions rolled to a 12-4 win over the Buffaloes at Stansbury High School. The error-filled defeat left Tooele coach Melanie Nelson frustrated as the Buffaloes (11-5, 2-2 Region 11) saw their region title hopes take a major hit. 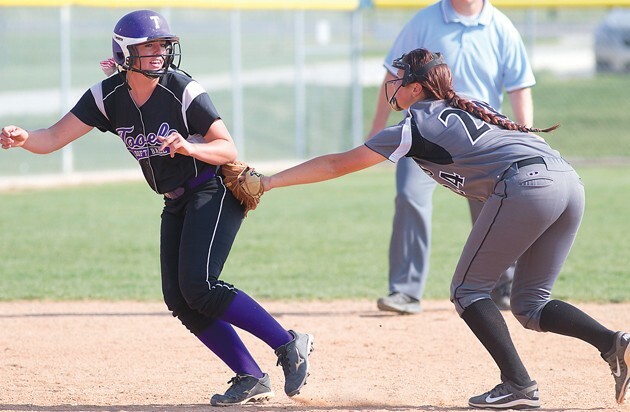 Tooele, which beat the Stallions (19-2, 4-1) 6-2 in the teams’ first meeting, grabbed an early 1-0 lead in the top of the second when Sierrah Anderson’s two-out double to left drove in Loryn Fonger. But then the errors started to come in bunches for the Buffs in the bottom of the inning, as an errant throw sailed over the Tooele dugout and allowed Stansbury’s Kilee Christiansen to advance to second base on an infield single. 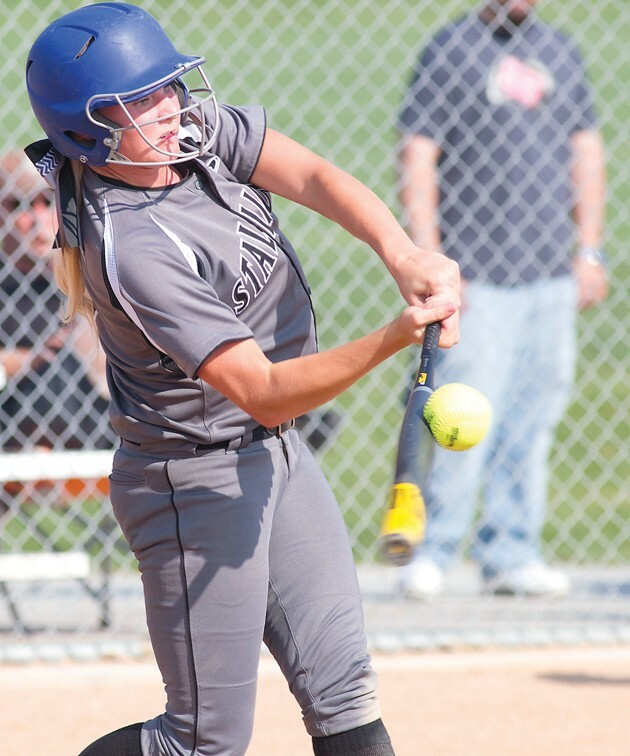 Jade Callister followed with an RBI single down the left-field line to tie the game. Tooele’s Trystin Crofts gave the Buffs the lead again in the top of the third with a solo home run off Stansbury pitcher Kimbri Herring. 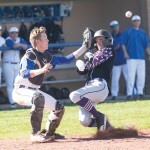 However, Tooele’s defense struggled again in the bottom of the inning. Alyssa Guymon led off the bottom of the third inning with a single to shallow right field off of Fonger, and advanced to second on a sacrifice bunt by Lindsey Allie. Guymon scored on Anjalee Batchelor’s single to right to tie the game, and Christiansen followed with a single to left. After Callister was retired on a chopper that stopped in front of home plate, Herring hit a two-run single to center to put Stansbury in front 4-2. Madison Riolo reached base on a fielding error to keep the inning going, allowing courtesy runner McKenzie Schofield to score. Riolo then scored on Alyssa Warr’s single, which also led Nelson to replace Fonger with relief pitcher Kamryn Grover. Fonger led off the top of the fourth with a single and scored on a double by Grover down the left-field line to cut the lead to 6-3, but Stansbury put the game out of reach in the bottom of the inning. Guymon led off with a walk, and Allie bunted for a single before Batchelor drew a walk to load the bases. Christiansen hit a two run single to right, and Batchelor eventually scored as a result of two wild pitches. Grover seemed to calm down after that, striking out Callister and Herring, but Riolo walked and Warr’s ground ball was mishandled by the Tooele infield, allowing the Stallions to add another run for a 10-3 advantage. Alyssa Arslanian scored Tooele’s final run after leading off the top of the fifth with a walk. Stansbury led off the bottom of the sixth with a single by Christiansen and a walk by Callister, followed by a double to deep center by Herring that drove in the Stallions’ final two runs. Herring earned the win for Stansbury, allowing four runs on four hits with four strikeouts and six walks in seven innings. Fonger, who returned to the circle to record the final two outs of the game, allowed four earned runs on eight hits with one strikeout and no walks in 3.1 innings and was credited with the loss. Grover allowed five earned runs on three hits with five walks and two strikeouts in 2.2 innings. 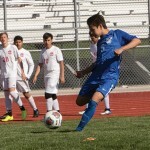 Stansbury faced Grantsville on Thursday in a game that was not complete as of press time. 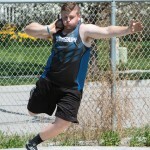 Grantsville and Stansbury came in as the only teams with only one loss in region play, with Thursday’s winner gaining a leg up in the race for the region title. Meanwhile, Tooele was looking to bounce back quickly for Thursday’s game against Bear River. A win would keep the Buffs within striking distance of the top spot in Region 11.